Often mummified and found in ancient tombs, the Sacred Ibis (family of the Hadeda Ibis photographed here) was much venerated & honoured by the Egyptians as they believed these birds resembled the god Thoth. In ancient times the Ibis was sacrificed to prevent flies from spreading pestilence across the land, and to repel serpents. 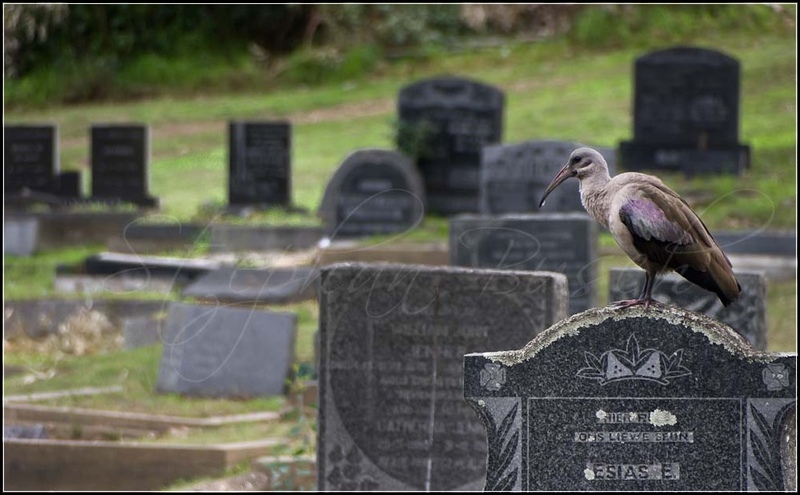 I rather fittingly photographed this Hadeda Ibis (I previously incorrectly said it was a Sacred Ibis, but thanks to Hilton for pointing out my hasty error) in a cemetery in Knysna ... not a fly or snake was in sight.